Rain or shine there is always fun to be had at the Carlisle Sports Emporium which hosts a myriad of exciting indoor and outdoor games! The Sports Emporium has one of the largest arcades in the area – 20,000 square feet – with over 100 games including video, racing, dancing, and simulation games. The rock climbing wall is almost like the real thing, as it moves in three dimensions to simulate a true to life experience. Pay as you go with reload-able play cards. The more you play, the more discounts you can receive. Lasertron is the ultimate 3D gaming experience. With two floors of futuristic visuals and sound effects, this is laser tag at it’s best. 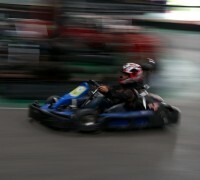 Go-kart racing is a hit with kids and adults alike, with three go cart tracks: one indoor track, one outdoor “Grand Prix” track for adults, and one “Rookie” track for ages 16 and under. Get a discount by buying a 6 or 10 pack. The Skate Zone Roller Rink is a hardwood-floor rink featuring ambient lighting and music. Saturday and Sunday matinees are from 1-3:45pm, and Saturday’s evening skate is from 7-9:30pm. The Sports Emporium also has two large outdoor miniature golf courses for those nice weather days, featuring extensive landscaping. The Victory Lane Cafe will keep your hunger at bay offering pizza, chicken, fries, snacks, desserts and more. Think of having a party at the Emporium for adults or kids. Weekly specials and combination packages can save you a bit more money. The Sports Emporium is open year round, but the hours change seasonally. Check the website for more details.